We all love decorating our houses and offices with flowers. 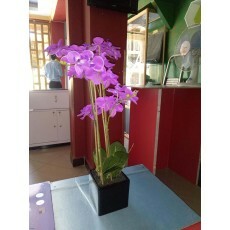 Have you tried to decorate your office, house or restaurant using butterfly orchid artificial flowers? Make an effort to purchase unique decorative one from our flowers selling shop and you will see the difference in your house or office. A butterfly orchid artificial flower is made of fabric and the stem is of made of plastic making artificial flowers a superior choice. Our artificial flowers are so unique and durable. We sell beautiful flowers that are easy to clean and are available in selection of colours. Decorative artificial flowers will give your house or office an everlasting beauty and save you a lot of money. We are dedicated to providing quality flowers in Kenya that are not only quality but also affordable. With our convenient online system you can buy flowers from our shop at the comfort of your home. Try us today to make a difference in your house.